C. sylvatica var. breviseta A. Gray, Man. 582. 1848. 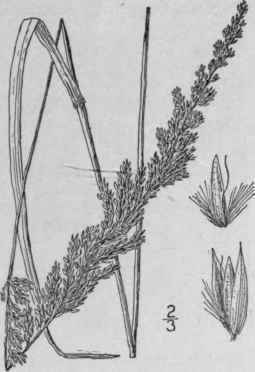 C. Pickeringii A. Gray, Man. Ed. 2, 547. 1856. C. breviseta Scribn. Mem. Torr. Club, 5: 41. 1894. C. breviseta debilis Kearney, Bull. U. S. Dep. Agr. Agrost. 11: 25. 1898. Culms I2'-i8' tall, erect, rigid, simple, scabrous below the panicle. Sheaths smooth and glabrous, the lower overlapping, the upper one elongatd; ligule 1"-3" long; blades 1 1/2-4' long, 2" wide, erect, smooth beneath, rough above; panicle 3'--4 1/2' in length, the branches ascending or erect, the lower l'-l 1/2' long; spikelets 1 1/2"-2" long, purple tinged, the outer scales acute, scabrous on the keel; third scale shorter than the second, obtuse, scabrous, the basal hairs very short; awn bent, not twisted, equalling or slightly exceeding the scale. In wet places, Newfoundland to the mountains of New England and northern New York. Occurs in the alpine region of the White Mountains. Aug.-Sept.
C. breviseta lacustris Kearney, Bull. U. S. Dep. Agr. Agrost. 11: 25. 1898. 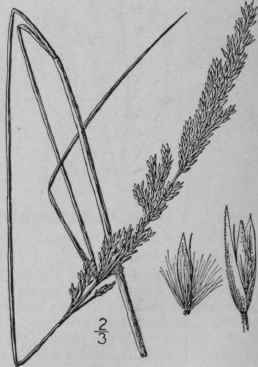 C. Pickeringii lacustris Hitchc. in Gray, Man. Ed. 7, 134. 1908. 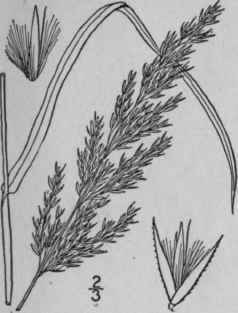 Culms 1 1/2°-3° tall, from rather stout rootstocks; leaf-sheaths sometimes bearded at the summit; blades 4'-8' long, 1"-2" wide, sometimes involute; panicle up to 6' long, its branches short and erect; spikelets about 1 1/2" long, the empty scales acute, strongly his-pidulous on the keel, the flowering scale rather thin, the awn attached 1/4- 1/3 way above the base, the basal hairs one-half to two-thirds as long as the scale, the palet markedly shorter than the flowering scale. Mountains of New England and along the Great Lakes to Minnesota. C. Porteri A. Gray, Proc. Am. Acad. 6: 79. 1862. Culms 2°- 4° tall, erect, simple, smooth and glabrous. 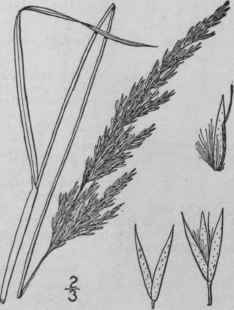 Sheaths shorter than the internodes, slightly scabrous, with a villous ring at the summit; ligule 2"-2 1/2" long; blades 6'-12' long, 2"-4" wide, rough; panicle 4's' in length, the branches erect, the lower 1'-2' long; spikelets 2"-2 1/2" long, the outer scales strongly scabrous, acute; third scale shorter than or equalling the second, obtuse, scabrous, the lateral basal hairs about one-third the length of the scale, those at the back short or wanting; awn bent, about equalling the scale, the lower part twisted. In dry woods, southern New York to Virginia. Aug.-Sept.
36. 1898. Not Philippi, 1896. Calamagrostis perplexa Scribn. Circ. U. S. Dept. Agric, Agrost. 30: 7. 1901. Culms 3º-5º tall, erect; leaf-sheaths glabrous, excepting the usually pubescent summit; blades flat, rather thin, rough, sometimes glabrous on the upper surface, lax, up to 1° long, 1 1/2"-3" wide; panicle 3-5' long, 1/2'-l' wide, contracted, acute, its slender, somewhat flexuous hispidulous branches erect or nearly so; spikelets 1 1/2"-2" long, the empty scales lanceolate to oblong-lanceolate, acuminate, sometimes keeled, the flowering scale ovate-oblong, about as long as the second empty scale, obscurely toothed at the apex or entire, rather firm, the awn attached near the base and extending somewhat beyond the scale, stout, bent near the middle, somewhat twisted at the base, the callus hairs white, about three-fourths as long as the scale. In dry rocky woods, Maine and western New York.